Aside from the basic ergonomics of a study space or home office outlined last week, it has got to be comfortable. It must allow you to focus and achieve the task at hand. At the same time, it should not be a place you dread, and can be made a bit more colourfully and inviting depending on you budget and tastes. 1. Decide where you work best. 4. Personalize your study space. Just to point out once again that ultimately you need to do what works best for you. Noise can be an issue for some, but personally I like to have a bit of classical music running in the background (as exemplified by the wall mounted speakers). Good lighting is crucial, if you want to avoid eye strain and so on. Natural light is also a plus if it is available. Thermal comfort likewise is important, but is usually relatively easy to fix (e.g. via clothing, fans & so on). Fourthly, study spaces (at least most students I know) tend to have an abundance of electronic equipment. This equipment emits harmful (not really deadly but still not healthy) ions in combination with the general toxins in the air. A simple solution, to lowering some of these toxins is to have a plant in your room. In addition, depending on what sort of plant you get, it can brighten up your room (plant in image is a Bromeliad). Finally, while hard to adhere to, it is a common recommendation to keep your study space separate from places such as your bedroom. Unfortunately, I think most students like me don't have the luxury of a separate room for a study. Now this is really up to personal preference more than anything else. Here are some ideas to get you started. 6. Just general arrangement of items. In regards, to photos if you are on a tight budget or like to recycle as I do, you can use CD jewel cases as an effective frame. 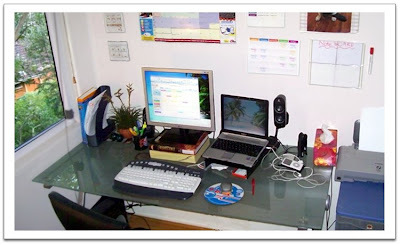 For more ideas have a look at other people’s workspaces featured at Lifehacker. Another beneficial object to have in your room is a calendar. A calendar on which, you can mark key dates and assessment due dates. I personally have a giant wall calendar, which acts as a feature in my study, but also serves the useful purpose of keeping me informed of what is round the corner. Though, I hardly ever use it myself (rather others leave messages on it) a white/cork board is useful to have. Once again, I recycled four CD Jewel cases (got millions of them) to make the noticeboard observed in the image. Your study space is a important area of your life. Get some habits in place for sorting out material now. Come exam time you should know where everything is and be able to access it with ease. Most importantly, whether or not you take up any of these ideas, find what works for you.